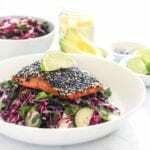 With a simple marinade and delightfully crispy crust, this Asian Sesame Crusted Salmon is a recipe you’ll want to savor every last perfectly flaky bite of. Pair it with Asian slaw for a complete, paleo, Whole30-friendly meal. In a glass jar, shake all the ingredients for the dressing vigorously until well incorporated. Prepare all ingredients for the slaw (cabbage, cucumber, herbs, scallion, rehydrated seaweed) as directed above. Toss them together in a bowl along with a few tablespoons of dressing. This can be done either in advance, or when you’re cooking the salmon if you prefer. When ready to cook, mist a frying pan with avocado oil and let it heat up for 1-2 minutes. Meanwhile dredge the fleshy side of the salmon fillets in sesame seeds. Remove the salmon from the pan and let it sit to cool slightly. Distribute the slaw between two bowls. Carefully remove the skin on the salmon (if on), then place a fillet in each bowl on top of the slaw. Serve with avocado and pickled ginger, with extra dressing on the side if needed. Note that coconut aminos are Whole30 compliant, but tamari and soy sauce are not.